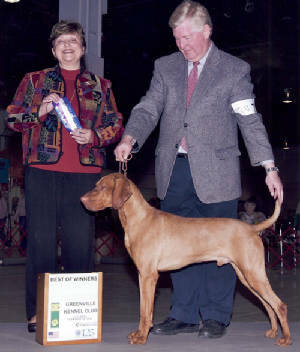 Orion finished his AKC Championship at the Raleigh KC shows on March 21,2009 under judge Charles Trotter! Finishing with 3 majors! Orion wins his 1st 3 point major at Clemson in May 2007! 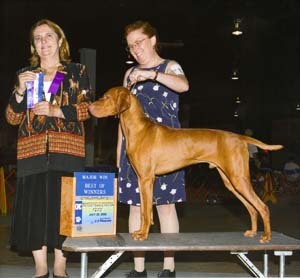 Orion wins BOB at Gray TN for 1 pt in May 2008! click here to go to OFA Orion's page for Test Results. 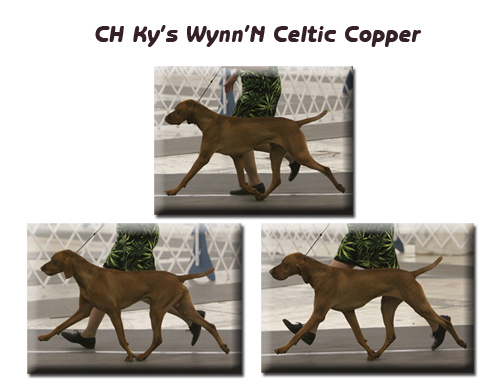 CH Wynn'N Celtic Copper JH. 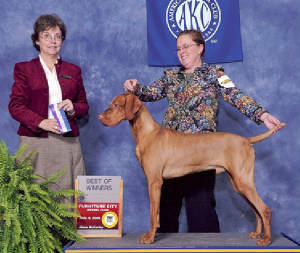 Copper made the Cut at the VCA Nationals and took 5th place out of 15 entries in the Bred By Exhibitor Class! 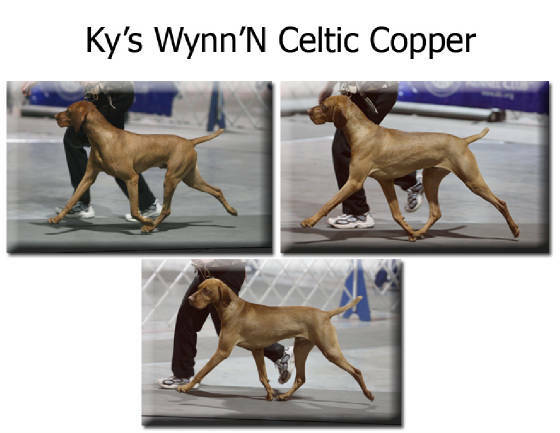 At the VCC Specialty Following Nationals "Copper" went on to get 1st in the Bred by Exhibitor Class and Winner's Dog finishing his AKC Championship with his 3rd major. 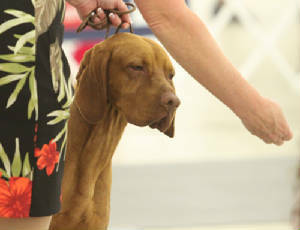 He received Winner's Dog with an entry of 38 other Vizsla Dogs for a 5 point Major on Sat. 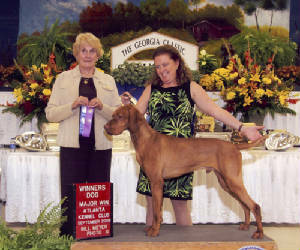 10/31/09 at the Vizsla Club of the Carolinas Specialty! Thank you Mrs Carol Brown for this 5 point major placement for this New Champion and for seeing the Wonderful Qualities in Copper! 10/31/09 WD for 5 pt major under Judge Mrs. Carol Brown following the Week of the VCA Nationals at the VCC specialty. Breeder, Owner, Handled! 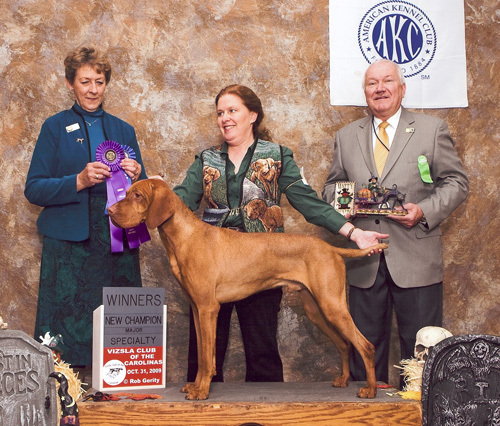 What a way to finish his AKC Championship with 3 major wins, for 3pts, 4pts and 5 pts! Copper Feb 2009 16 months! Thanks Jack for helping me with this Wonderful Boy! 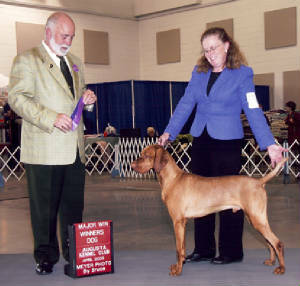 Copper 1st major Win at 18 months! click here to go to OFA Copper's page for Test Results. Hey guys look at me! Copper movement at 2 years old! Thanks to all the judges who recognized this boy for his special qualities as well as all of my friends that have given me continued support! And to the wonderful families of both these boys, the Tedrows who love and co-own Orion and the Randals wo love and co-own Copper. 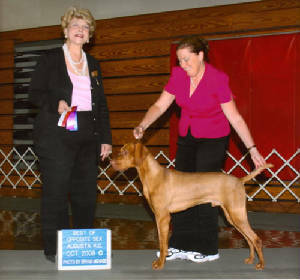 Both of these boys are retired from showing after their Championships and continue to live as beautiful "just Champion pets".